Washington Square Press, 9780671028510, 224pp. In this compelling companion volume to her acclaimed memoir Home Before Dark, Susan Cheever once again gives readers a revealing look into her famous family, whose secrets and eccentricities parallel their genius and successes. Set against the backdrop of Treetops, the New Hampshire family retreat where the Cheevers still summer, and going back several generations, this powerful remembrance focuses on Susan Cheever's mother's family, and includes portraits of her great-grandfather, Thomas Watson, who invented the telephone with Alexander Graham Bell, and her grandfather Milton Winternitz, a brilliant doctor who built Yale Medical School. And of course there is her beloved and talented father John Cheever, the accomplished author who became one of the most well-known writers of the century, often using his family as material. Perhaps most riveting about Susan Cheever's second biographical masterpiece is its exploration of the lives of the Cheever women. At once a unique family portrait and the tale of every family, Treetops draws us effortlessly into a fascinating yet endearingly familiar world. The Wall Street Journal Ms. Cheever's...coolly intelligent perspective...provides a clear, hard-edged picture of the snobbery, sexism, anti-Semitism adultery, alcoholism, and emotional dishonesty that were part and parcel of those swimming pools and tennis courts. 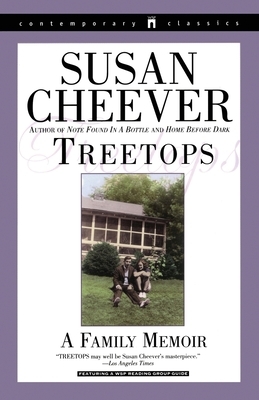 The Washington Post Book World Engrossing...moving...Treetops is Susan Cheever's...most satisfyingly realized work to date. Houston Chronicle This smooth, articulate, inviting book takes us into the lair of a celebrated family. Susan Cheever, with keen observation and incisive character sketches, offers a tantalizingly spare memoir. Los Angeles Times Treetops may well be Susan Cheever's masterpiece. New York Daily News Because it's such a fascinating family, it's a fascinating book, but it's not always a pretty story, and one has to admire Susan Cheever's courage in telling it....Her greatest gifts come across in her memoirs....Home Before Dark and Treetops have established her as a very accomplished writer.